After a slight delay, the baseball hot stove is finally starting to heat up. It seems likely that the next domino to fall will be starting pitcher Yu Darvish. Other than perhaps Jake Arrieta, Darvish is considered the top starter on the free agent market this winter. In recent days, he’s had meetings with several teams and hasn’t been shy about letting the world know on social media the teams he’s spoken to this offseason. It’s a little tough to spot a clear frontrunner, but let’s run down each team’s odds of signing Darvish this offseason. The Astros had a formal meeting with Darvish earlier this week, so they’re definitely in the mix. With Justin Verlander and Dallas Keuchel already leading their rotation, the reigning world champions don’t exactly need an ace like Darvish in their rotation. But that doesn’t mean they won’t make a serious effort to sign him and chase a second straight championship. There were briefly rumors on social media that Darvish had agreed to a deal with the Cubs. Darvish was quick to squash those. But the ace did say that his meeting with the team earlier this week went well. The core of Chicago’s roster still isn’t making that much money, so the Cubs have some money to spend. Darvish is unlikely to sign with a team without at least considering a competitive offer from the Cubs. Darvish’s World Series struggles make it a little less likely that he’ll return to Los Angeles. The fact that the Dodgers want to get under the luxury tax threshold also makes a reunion with the Dodgers unlikely. Of course, the Dodgers freed up some money with last week’s trade with the Braves, so they may have enough payroll to afford the $20 to $25 million per year Darvish will likely command. Remember, the Dodgers are all about trying to win, so if they think Darvish can help them, they’ll make a serious effort to sign him. Darvish met with Rangers GM Jon Daniels earlier this week. Daniels said the meeting was scheduled all offseason and that the two were sitting down as friends. When the Rangers traded Darvish in July, it pointed to the team not making a serious effort to bring him back. That being said, Darvish spent over half a decade in Texas, so a reunion shouldn’t be ruled out. The Twins are an interesting dark horse in the competition to sign Darvish. There are no reports of a formal meeting just yet, but the Twins are definitely interested. As a small-market team, there are questions about Minnesota’s ability to afford Darvish. However, the Twins can sell him on the chance to become the ace of an up-and-coming team and chase a championship with a team that’s clearly on the rise after reaching the postseason this past season. With any high-priced free agent, you have to assume the Yankees will be involved. Recent rumors indicate that the Yankees are pursuing a trade for Gerrit Cole. But if they can’t work out a trade for Cole or another frontline starter, New York could focus on Darvish. Like the Dodgers, the Yankees want to reduce payroll and get under the luxury tax threshold. But they still have a couple players they can trade away to cut payroll and find room in the budget for Darvish. It’s tough to find someone emerging out of the blue to sign Darvish, but the possibility can’t be ruled out. 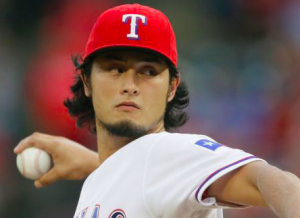 It wouldn’t be that far fetched to see teams like the Angels, Cardinals, Giants, Nationals, and Phillies get involved with Darvish before all is said and done. Howver, it’s far more likely he ends up with one of the six teams listed above.